Beats by Dre & Sacai Announce Limited-Edition Earphones – Spotlight Report "The Best Entertainment Website in Oz"
Beats by Dr. Dre (Beats) and sacai have joined together to reinvent BeatsX wireless earphones in three new whimsical colorways: Burned Red, Deep White and True Black. The collection takes inspiration from jewellery and merges it with the everyday utility of headphones by adding customisable beads that can be attached to the neckband to match the user’s unique aesthetic. The result is a personal accessory that is playful and individualised, while also keeping you connected to the music. First revealed in sacai’s Men’s 2019 Autumn & Winter and Women’s 2019 Pre-Autumn show in January, BeatsX was one of the prominent accessories for many of the looks in sacai’s latest collection. 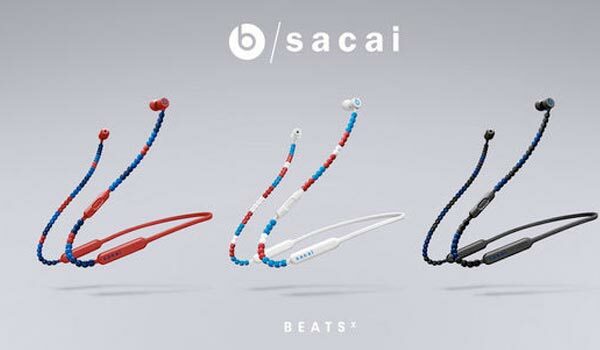 As part of the creative partnership, Beats was given the opportunity to take one of its latest wireless products through sacai’s hybrid effect, a design concept that juxtaposes contrasting textures and patterns to build something transformative and unexpected. In a behind-the-scenes look at the concept and creation of the collaboration, sacai’s Founder / Designer Chitose Abe and Beats President Luke Wood meet at sacai’s headquarters in Tokyo and discuss the hybrid process, the influences behind the two brands’ design as well as their mutual appreciation for strong identity. Also featured in the short film is artist, songwriter and audio engineer Syd as well as the track “Come Together” off her neo-soul band The Internet’s latest album Hive Mind. Chosen to lead the collaboration’s accompanying campaign, Syd’s inherent sense of individualism and ability to merge many musical and cultural influences to create an evolved sound is exactly aligned with the inspiration behind the collection.